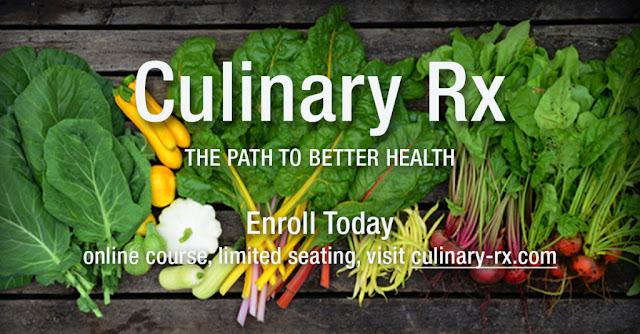 Culinary Rx is an online instructional cooking and nutrition course that healthcare professionals prescribe to their patients for prevention, treatment, and lifestyle health. The goal of the course is to empower patients through their transition to a healthier, whole food, plant-based way of living. Taught by leading chef educators and medical professionals, your Plantrician Culinary Rx course, powered by the Rouxbe Cooking School, delivers detailed video cooking instruction, and nutrition fundamentals to home cooks and patients that want to change their health through food choices and cooking. Completing the course will provide you with the starting tools, resources and culinary confidence to take control of your life through food and cooking. Earn a "Certificate of Completion"
The cost of the program is $99.99. For a limited time - receive 50% off by using the coupon code: TastyLife. Having been a past graduate of Rouxbe’s Professional Plant-Based Certification Course, I can attest that Rouxbe will instill in your the culinary skill and knowledge development to be confident in your own plant-based cooking. So if you're having trouble switching over to a whole-food, plant-based, oil-free lifestyle to Beat MS or are just looking to sharpen your cooking skills, check out Culinary Rx.